What if there is some sanity in their craziness? With the recent political rhetoric heating up, it may not be too bad of an idea to at least consider ensuring your family rides the worst of it out. Even though if the worst does happen, it would be thousands of miles away, fallout can, because of weather patterns, spread for hundreds and thousands of miles (for those old enough to remember, think Chernobyl). Because we care for the survival of the human species, we’ve put together some guidelines to build the ultimate nuclear fallout shelter – both practical, and to some extent, comfortable. If you weren’t already annihilated by the initial burst (which honestly, may be the best option), you’ll have to live out the radioactive fallout. That means your shelter will have to be built underground – but no more than 3 or 4 meters because that risks your exits being blocked in case you need to get away. Packed earth, or alternatively, about 15 centimeters of lead (which is hard to get) is very effective at insulating against radiation. Thankfully, there’s no shortage of sand and soil here in Dubai and the UAE. So initially, you’ll need hire someone to help you dig a deep trench before you start construction. 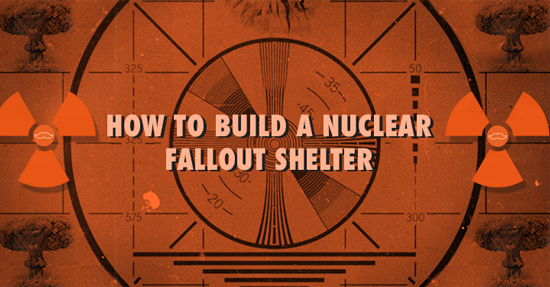 When design your shelter, you’ll need to protect from more than radioactive fallout (which the soil will cover) – but also from initial blasts. So your roof should be a mix of concrete and reinforced steel rebar with walls between 30 and 80 cm think. When it comes to space, let’s consider the Swiss standards – at least one square meter for every individual that will stay in it. Of course, if you’ve got the money, go crazy and go spacious. You’ll have to be completely off the grid as, most likely, the power plants will stop functioning after a few days. Get an electrician to install solar panels (makes sense if you are far from the battlefields), large battery systems to store the electricity from those panels, and a way to charge those batteries using only human power. Hey – hook your batteries up to your treadmill maybe; who says you can’t stay in shape while waiting out the apocalypse? As you’ll be living underground, ventilation is crucial. Add a ventilation and air-filtration system that can be operated with a hand crank in case of a power failure. The filtration system but take into account radiation, dust, and other particulates. Air conditioning is a plus if you can secure constant power, but don’t rely on it. Of course, once your shelter is done, you need to store as much water as possible. If you have a well, (highly unlikely in the deserts of the UAE), make sure that it’s connected to your shelter and has multiple levels of filters to filter out the radiation, viruses, and other potential contaminates. Also, in the event of no power, make sure you install a manual pump. If a well is not an option, make sure you have water for at least 14 days (the time that is ‘hypothetically’ safe to go out considering the half-life of radiation and your distance away from ground zero) but count on having water supplies for at least three months. Stock up on a LOT of canned food with expiration dates well beyond what you need. You can throw your veganism, paleo-ism, and other questionable and hipster diets out the window. The key is survival here. Funny enough, those preservatives that slowly kill us will be the ones that help us live in the event of nuclear war. And as a piece of advice – get honey. LOTS OF HONEY. And only real honey. Honey is the ONE food that doesn’t expire; jars of honey found in pharaohs tombs in Egypt are as edible today as they were 3000 years ago. Besides its infinite and time-defying longevity, honey has the nutrition you need during your underground stay. If you’ve got the money, go crazy! After all, your shelter may be your home for 2 weeks, 2 months, or 2000 years. Add quality tiling to your kitchen for that personal touch; make some custom-made furniture to go along with your end-of-the-world inspired theme. Paint the walls nice and bright (as you may not see the sun for a while). And when you think the time is nigh before you move in, get some pest control then some deep cleaning done because this is literally your last chance. As a customer-first organization, we don’t claim to be experts in building shelters, but we do care about people. For those experts, turn to our Ustas – the true heroes - to help you build your dream nuclear shelter. So bunker down and get building!